While charcoal grills are one of the most preferred methods for grilling, they can also be the biggest hassle to light. Fortunately, by using one of the best charcoal chimney starters on the market from the list below, lighting your charcoal grill can be quick and easy – all for an affordable cost. Although chimney starters are known primarily for creating rapid fires, these handy accessories have a few other benefits as well. For example, charcoal chimneys save you from having to use the dreaded lighter fluid to start your fire. It’s always a good idea to avoid lighter fluid as it can leave behind a distinct smell and taste on your food, which for many is a deal breaker. Also, lighter fluid contains hazardous additives many prefer not to consume in any amount. Looking for the right charcoal chimney starter seems incredibly simple. However, with so many cheaply constructed options at hand, it’s easy to get suckered into picking the wrong one. After reading the below charcoal chimney starter Best Of Class list, you won’t have to settle for an inferior product. These charcoal starters on my list are all incredibly effective but there are some things you should consider before making your decision. Luckily, I’ll show you the most important things you should keep in mind when it’s time to buy. Click a topic below to be taken directly to that section. Do You Need A Charcoal Chimney Starter? Final Verdict – What Is The Best Chimney Starter? There are many options when it comes to chimney starters, but not all of them are a value buy and worth our investment. Fortunately, several quality options are priced quite fairly. But how do you know which ones hit the mark? If you’re looking to get your grill up to cooking temperature quickly, efficiently, and most importantly, safely, then this list is for you. I’ve done all the legwork for you and reviewed the latest charcoal chimney starters on the market from the top manufacturers. The outcome of my testing and research has led to the below list of the best of the best of chimney starters. 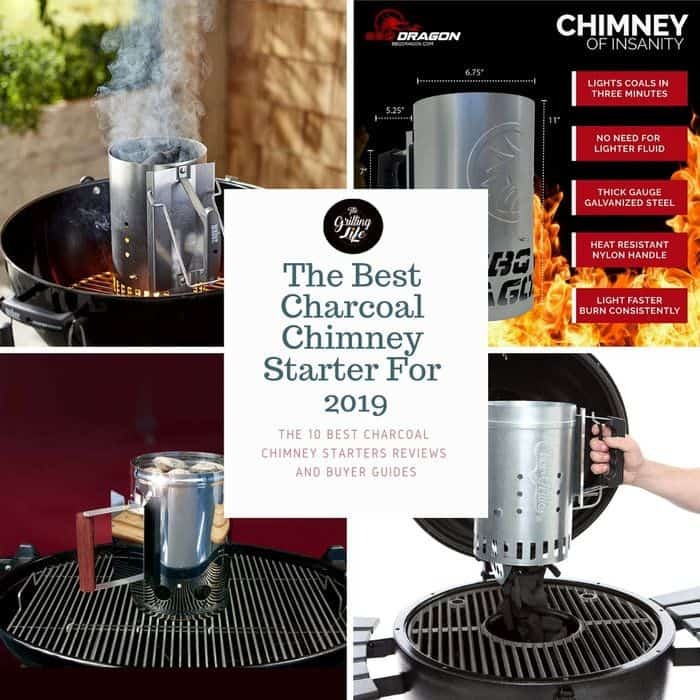 I’m confident when I say the following line up represents the best charcoal chimney starters in the market today and I know you will be able to find the perfect one for you. So go ahead and let these product overviews act as your buyer’s guide to the top performing BBQ chimney starters available. I put together the below list of the 10 best charcoal grill chimney starters options to act as your guide to choosing the best one for your budget and needs. Read on for my top picks now. One of the absolute best charcoal chimney starters to date is the Weber 7416 Rapidfire, which has earned an average rating of 4.8 out of 5-stars on Amazon. When it comes to charcoal chimney starters, Weber is king. They have been making this same product for years and it is still the well-made and quality product from when they started. I’ve read more than one review stating that they have had their original Weber 7416 Rapidfire Charcoal Chimney Starter for 20 years before it finally gave up the ghost. Now that is quality. I’ve personally had mine for over 10 years now and it is still going strong. It features an attractive, modern, aluminized steel body that helps resists heat and rust quite well. The heat-resistant thermoplastic handle is comfortable to hold and stays cool to the touch. With a dual handle design, the Rapidfire definitely allows you to have greater control when lifting and pouring the chimney. The built in heat shield is larger than any other I have seen and really protects the hands from the heat. This chimney starter can handle all types of charcoal and have them lit and ready to go within 20 to 25 minutes, evenly heating the coals in the process. With an easy-to-follow set of instructions on the packaging, just about anyone can use the Weber 7416. The key feature of this chimney starter is the conical wire grid inside that holds up the charcoal. Unlike the vented metal plates inside the most chimney starters, this wire grid lets all flames from the newspaper through to the charcoal, resulting in the charcoal lighting quickly and evenly. Since this Weber chimney has such great reviews, it’s difficult to find many valid complaints. However, there is one worth mentioning. Because of the wire grid that holds the charcoal, the smaller pieces tend to fall through the bottom of this chimney starter. Nevertheless, this is a minor con that can be overlooked. Other than this minor nitpick, there aren’t really many complaints that can be made about the Weber 7416 Rapidfire Chimney Starter. This chimney has been good to thousands and has great longevity. If I could only recommend one charcoal chimney starter, this would be it. For such a long-lasting and high-quality product, the price can’t be beaten. Go read user reviews for yourself and you will see that I am not alone in thinking this. Originally, $17.99, currently on sale for just $9.99 on Amazon, the GrillPro 39470 Chimney Style Charcoal Starter has great function and style for an affordable cost. The stainless-steel body of this GrillPro chimney can hold up to 2 pounds of charcoal and only takes about 10 minutes before the coals are ready for use. Speedy! Best of all, not only do you not need to use lighter fluid; there is also no need to relight or fan your coals. And if you live in a windier region and/or love to grill every season, you’ll be glad to know that the GrillPro 39470 Chimney Style Charcoal Starter performs well even in the heavier wind. However, some complaints with this chimney starter are that the construction is on the thinner side and doesn’t contain as many air holes like some other starters on the market. Still, many find that the starter works well – that’s what’s important. When it comes down to the big picture, the GrillPro 39470 Chimney Style Charcoal Starter is a great price for what it’s worth, and it gets the job done quickly. After several uses, I was very happy with the performance of the GrillPro 39470 Chimney Style Charcoal Starter. Simply stated, it does what it says it will do and that counts for a lot in my book. I can’t vouch for the longevity of this product as it is pretty new to me and I have only used it a handful of times, but I am impressed by it so far. I recommend this product for the novice and avid griller alike. For those wanting a 4.5 out of 5-star quality chimney starter for their Jumbo Joe or Weber Smokey Joe, the Weber 7447 Compact Rapidfire might be a great choice for you. Featuring a heavy-duty, aluminized steel body and an ergonomic, ribbed handle, you’d be thinking that this lower-end Weber starter would be double the cost. In fact, the Weber 7447 Compact Rapidfire Chimney Starter has even earned Amazon’s Choice for “charcoal chimney starter” for its great quality, popularity, and ideal price point for consumers. Users find that this chimney starter works great with all types of charcoal and is especially ideal for compact grills or short grilling sessions due to its design. This is also a great chimney for Dutch ovens. The compact design is perfect for camping, tailgating, and smaller grills. The Weber 7447 is still a reliable buy. It’s easy to hold, performs as intended, and is incredible for not just smaller grills, but I also use it when I need to add coals for long cooks. BBQ Dragon states that their Chimney of Insanity Charcoal Starter is supposedly the fastest and easiest to use among all other charcoal chimney starters. It features an innovative 90-degree elbow on the side of the chimney to increase more airflow than other chimneys and light charcoal faster and easier. The side hole also doubles up as an insert to add more fuel or lighter material without having to lift the chimney. With great construction, a stay-cool nylon handle, and a full-length heat shield for added protection, there’s no need to worry about the BBQ Dragon Chimney of Insanity Charcoal Starter warping or you burning yourself while using the chimney. In addition to lighting quickly and starting fires effortlessly, this BBQ Dragon chimney works well with just about any fire starter and can even be used as a forced air cooking stove with the addition of a side fan. While a very worthy choice, there are a few things to mention. For one, this chimney doesn’t hold as much charcoal as some may need. Secondly, this chimney starter is on the higher end of some people’s budgets. However, if you remember that you’re getting an innovative, versatile product with phenomenal construction, that takes some of the sting out of the cost. With more pros than cons, the BBQ Dragon Chimney of Insanity Charcoal Starter really does live up to its name and does the job well. The BBQ Dragon Chimney of Insanity is a great product even at it’s higher price. It’s worth the buy if you grill with charcoal throughout the year. For those who demand great construction and quality customer service from the manufacturer in case all fails, you can get both when purchasing the Firefly Grill ‘N More. This Firefly product offers gorgeous, stainless-steel construction and a stay-cool plate along with a Bakelite handle and galvanized grid charcoal rack. Even with quality materials, you can appreciate that this chimney starter still has lightweight construction, making it easy to handle. Besides fantastic construction, you can expect the Firefly Grill ‘N More to heat up your coals hotter than if you were to use lighter fluid. With even-burning coals, this chimney takes the dirty work and stress off your hands. Truthfully, the only notable con isn’t really a con at all for some people: the price. Being on the higher end cost-wise, this may drive people away from the Firefly Grill ‘N More, but in reality, it’s worth the price. Even if you aren’t big on the Firefly Grill ‘N More, you can always get 100% of your money back guaranteed within the first year of owning this product. But with an average rating of 4.7 out of 5-stars on Amazon, favorable construction and function, and the right size to hold the perfect amount of charcoal, it’s hard to resist the Firefly Grill ‘N More. Safely light up your charcoal smoker or grill in 20 minutes or less with the beautiful Cuisinart CCC-100 Charcoal Chimney. With large heat shield flaps for added protection and evenly-spaced holes for proper airflow, Cuisinart has a safe and functional product up their sleeves. Many find that this chimney heats charcoal quickly without zero need for lighter fluid. Thanks to the extended shield flaps, you’ll also notice that the handle stays cool to allow for easier handling. The function is great, but when it comes to the cons, people seem to be attacking the aesthetics of this chimney. For instance, some state that this product tends to get discolored and/or rusted after a few uses. Some even state that the wooden handle on this product was a bad choice as it is a bit slippery – so the best advice is to wear heat resistant gloves. But if the function is more important than looks for you, the Cuisinart CCC-100 Charcoal Chimney will still do you good. After all, this product readies your coals quickly for grilling, has a favorable extra-large and extra-thick heat guard that many love, and even comes with a one-year warranty just in case. The Char-Griller Charcoal Chimney Starter boasts the Patented Trigger release when squeezing the handle with the bottom drop design. This allows you to conveniently and safely empty the hot coals out of the bottom of the chimney starter canister. This is one of the few chimney starters I have seen with this innovative option. It really makes the process safer and simpler. This chimney starter is made from Zinc coated galvanized .6 mm steel. It also has a plastic ABS handle with a built in heat shield to protect your hands. There are a few things you should know. First, the heat shield is a bit smaller, which makes it a good idea to wear gloves when operating the chimney. Also, know that if not stored properly, this chimney may begin to rust. While the latter con is avoidable, I will also say that the hinged door on the bottom of this chimney is thinner than the rest of the construction and is prone to detach. But if it does detach, it’s an easy fix, of course. One big plus is that the customer service from Char-Griller is top notch so if something goes wrong, they are there for you. Putting everything into perspective, the Char-Griller Charcoal Grill Chimney Starter is a great option if you prefer a quick and clean fire start-up. It has worked out well for many, and it can work well for you too if you give it a shot and take good care of it. The hinged door is on the thinner side. Overall this is an innovative and convenient charcoal chimney starter. It is a good option for the less frequent griller who won’t put a lot of wear and tear on it. I was tempted to give it a 5-star rating based on coolness and convenience alone. This next product is for those who frequently camp or travel. The Outset 76356 Collapsible Camping Grill and Chimney Starter isn’t just a chimney starter; it also includes grill grates to transform into an on-the-go grill! With simple, collapsible storage, this chimney-grill duo makes transportation and storage effortless. Thanks to assembly in just 15 seconds without any tools and rapidly-heating charcoals, the Outset 76356 will ensure you have your grill started in no time. While the function and convenience of this chimney and grill combo are well-favored among reviewers, I’ve got to mention the negatives as well. Fully loaded, this chimney creates a fire that’s too hot for traditional grilling. Fortunately, there is a solution if you do find that the fire is too hot for grilling: simply use fewer coals. In the end, this chimney starter on the go is great for camping and tailgating, the handle stays cool to the touch for safety purposes, the construction is portable even for travel, and creating a nice sear on this baby is a definite bonus. Hard to beat that. If you light your coals with the handle folded in, the handle will distort. Some claim that the fire gets too hot for regular grilling. The Charcoal Companion Stainless Steel Chimney Charcoal Starter may be simple in appearance, but it knows how to start a charcoal grill or smoker, so it’s worth a look. First things first, this charcoal starter offers phenomenal construction with its heavy-gauge, stainless-steel body and thick, wooden handle with a stainless heat shield for added protection. Lighting coal quickly and evenly without the need for using lighter fluid, this Charcoal Companion chimney starter ensures your grill will be started in under 15 minutes with up to 5 pounds of coal which is huge. It is one of the bigger charcoal chimneys on the market. The handle is made of naturally heat-resistant rosewood with a stainless steel heat shield for keeping hands safe from the heat. Even though the manufacturer claims it is rust proof, some users still report rust accumulating on this charcoal starter after a few uses. I have also notice that the rivets are poorly designed and can start to get loose on this over time. Even if you are worried about the construction holding up on this Charcoal Companion charcoal starter, know that there’s a lengthy 5-year warranty attached, which is incredible. As long as you don’t plan on frequently using your chimney or leaving the product out in the rain, the Charcoal Companion Stainless Steel Chimney Charcoal Starter is quick and easy to use and has generally favorable construction, and not to mention, a great warranty. After a few uses, the shiny stainless steel look becomes tarnished from the heat and does not come off. Overall, this is a quality product that is built to last. You may have to replace the rivets holding the platform (bottom) with screws, as they tend to corrode fast, unfortunately. I have done it and it is really very simple and I have not had a problem since. This product should outlast most other chimney starters and is great for people who need to burn a lot of coals for your cooks. Get your charcoal grill or smoker fired up in half the time with the Char-Broil Half-Time Charcoal Starter. Another innovative design, the Char-Broil Half-Time Charcoal Starter claims it can heat large amounts of charcoal in half the time that it takes in standard chimney fire starters. The wider design is great for lump charcoal too. With an attractive aluminum body, extra-wide diameter, ribbed handle, and plenty of holes for ventilation, it’s easy to find the Char-Broil Half-Time attractive, ergonomic, and functional all at once. Focusing on the benefits of this chimney, this bad boy is easy to assemble and works well with many types of charcoal and fire starters. Additionally, many like that the handle of this charcoal starter is far away from the chimney itself to provide protection from getting burned. Coming to the cons, the bottom of the chimney tends to get warped rather quickly. There are several reports that the rivets holding the bottom try intact have fallen off after a few months. Fortunately, these are easy to tighten or replace. Construction-wise, while the chimney is generally easy to put together, a few have mentioned that aligning the holes on the handle and heat shield with the holes on the base is a bit difficult. Other than those cons, the actual function of the Char-Broil Half-Time is not bad at all. All in all, the Char-Broil Half-Time Charcoal Starter is quick to light charcoal, is perfect for smaller grills or grilling sessions, and has great ergonomics and safety, making it one of the better charcoal chimney starters out there. The bottom tends to get warped a bit. This is another quality product that really speeds up one of the most boring steps when grilling. I had a little difficulty with assembly but it was sturdy when I completed it. When I tested it against a few other chimney starters, it really was almost 2x faster for lighting charcoal. I recommend this product for people who want to speed up the process and for people who have smaller grills and don’t need as much charcoal. I also recommend this product for anyone who uses lump charcoal. For those new to charcoal grilling or smoking, it would make perfect sense to look into charcoal chimney starters. Even if you only know the term ‘charcoal chimney starter’ and have yet to actually put a face and function to it, reading through our frequently asked questions and answers list below can help familiarize you with what these starters do and how easy they are to actually use. For those with a charcoal grill or smoker, having a charcoal chimney starter is not do or die, but it’s a big help. In fact, it’s considered the quickest and simplest way to light charcoal. Don’t knock it ‘til you try it. How Do You Light A Charcoal Chimney? Lighting a charcoal chimney is easy, but it might take a few tries until you get the hang of it. You’ll get faster each time. Completely open the damper on your grill’s lid, and place the lid off to the side. If applicable, clear out any ash from the bottom of your grill. Open the damper blades all the way at the bottom of your grill. Fill up your chimney, and add some crumbled newspaper to the bottom. Remove the top cooking grate. Set the chimney right side up on the lower rack of your grill. Stick a lit match in several areas toward the bottom of your chimney where the crumbled papers reside. The fire from the paper will transfer to the coals. Place the top cooking grate back on your grill along with the lid. Wait approximately three minutes, or until your grill reaches the ideal temperature, before popping on your food. How Long Do You Let Charcoal Burn In A Chimney? Some charcoal chimneys take longer than others. However, it shouldn’t take longer than about 20 minutes to heat up your coals. The length of time you may need to burn your charcoal may also depend on how much charcoal your burning, the type of charcoal you’re utilizing, and the wind conditions. How Do Charcoal Chimney Starters Work? Once the paper or other fire starter is lit at the bottom of the chimney, the charcoal chimney starters light up charcoal or briquettes toward the bottom of the chimney. The ventilation in chimney starter acts as a vacuum and allows airflow to enter to provide the right amount of oxygen, adequately helping to grow the fire. What Is The Best Charcoal Chimney Starter? Your best charcoal chimney starter may or may not be one of the above. Either way, don’t neglect the importance of doing adequate research on each starter you come across. Take note of the pros and cons, features, materials, size, how much charcoal the chimney can hold, whether or not it needs lighter fluid, what grills it is most relevant for, pouring method (pour from top or bottom chute), the time it takes to light up charcoal, and lastly, the aesthetics and the price of a charcoal chimney. Regardless of the choice you make, investing in a charcoal chimney starter is a wise choice and a terrific addition to your grilling toolbox. By focusing on construction, safety, and size, you can narrow down your decision considerably. While there are many solid choices on this list, the Weber 7416 Rapidfire Chimney Starter is the top choice for 2019. Without question, the Weber Rapidfire Chimney Starter provides quality and high performance and checks the boxes for most everyone’s needs. The bottom line is that if you are in the market for an easier, more efficient way to fire up your grill or smoker, you won’t go wrong with any of the quality choices on this list. Each chimney starter offers good to great value and should serve you well for many meals to come. 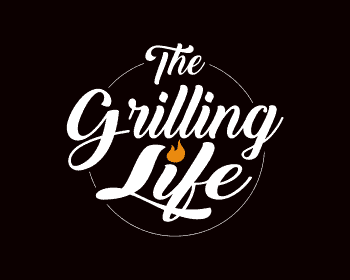 After all, lighting your charcoal grill quickly, safely and efficiently should be an afterthought for any backyard grill master so you can focus on cooking. Which chimney starter for lighting your grilling have you used before? Have you used any of the chimneys listed above and have any feedback to share? What features do you typically like to see in a charcoal starter? Awesome review Patrick! Very detailed info. I like how you mentioned the price, rating, pros, and cons to help make a decision on which is best. And I appreciate the bonus reviews. Keep it up!! Hi Seth and thanks. I am glad you liked and hopefully this helped you in your decision making process. Don’t forget to check back in from time to time as I am always on the lookout for helpful tips or stories I can share. Happy Grilling! I like the Char-Griller Charcoal Chimney Starter. I love it that it makes emptying the hot coals so safe and convenient. We love grilling food and we make it a point to do this on weekends with family and friends. And this would definitely make it easier for us. I think I will head on to Amazon to buy one. Can I just click on your link to do that? Hi Kathy and thank you for stopping by. I really like my Char-Griller model too. It really is a convenient option. The link I provided will send you directly to the Amazon Char-Griller Charcoal Chimney Starter page. If you have any questions, I will be happy to help. Don’t forget to check back in from time to time as I am always on the lookout for helpful tips or stories I can share. Happy Grilling! This is part of you review and I was curios if it was a typo. You started talking about the weber and then referred to the grill pro. (When it comes to charcoal chimney starters, Weber is king. They have been making this same product for years and it is still the well-made and quality product from when they started. Hi Pamela. You are correct, that was definitely a typo and was meant to say the Weber 7416 Rapidfire Charcoal Chimney Starter as you suspected. I really appreciate you pointing that out to me as I had totally missed it. I have since corrected the mistake. I appreciate you taking the time to read my article and greatly appreciate your feedback. I hope it was helpful and I hope you come back again. Let me know if I can ever answer any questions you may have or help in any way.